Be home every night, and get paid weekly! TMT Enterprises, Inc., one of the most respected dump truck fleets in Northern California, is hiring full-time local drivers, from the Bay Area, south to Salinas. This is your opportunity to join the A-team. Our drivers are the best paid in the industry. We offer generous compensation, including; paid medical, paid vacation, generous yearly performance bonus, paid sick days, and a 401k with matching company funds. Workdays are Monday through Friday, with occasional Saturday work (pays extra). Work days typically start around 5-6 AM, and end around 3-4 PM. We have transfer, and end-dump trailers. Our equipment is all late-model, and well maintained by our in-house shop. •	Have a Class A license with a clean DMV report (1 point max). •	Minimum of one year of recent, verifiable experience in a Class A truck. •	Dump truck experience is a plus, but not required. •	Need to be able to read, write, and communicate clearly in English. Spanish is a plus. •	Must be physically capable of handling the work, be able to lift at least fifty pounds, and be able to climb up and down on the trucks safely. •	Must be a legal resident of the US, or be legally eligible to work in the US. We have been in business over 50 years, in the same location, and we have lots of steady work. This is very rare for us to be hiring. Our drivers mostly stay until they retire! We have immediate openings, and will get back to you quickly. We are very happy to announce the addition of Steve Byrne to the TMT Enterprises family. Steve’s Rutgers education and experience as a golf course superintendent bring a new level of knowledge & understanding to the team. He started working with us a few months ago, has been learning the ropes and teaching the rest of us a few things along the way. Steve hit the road running and is becoming a great presence in the Nor-Cal golf course world. Many of you have already seen him, either at your golf course or one of the chapter meetings. From Santa Rosa to Visalia, Monterey to Reno, Steve has been making short work of getting around and making the introductions. While his initial responsibilities are primarily in the golf course market, Steve will also be working with municipalities, universities, school districts, contractors and more as he gets more acclimated to the many markets served by TMT Enterprises. Feel free to email him at steve@tmtenterprises.net. I’m sure he’ll be happy to hear from you and eager to help you in any way he can. Last week we introduced you to the latest addition to our product line. If you are tired of wasting precious man-hours maintaining your mulched areas, BarkBinder is the tool you’ve been looking for. BarkBinder comes in one or five gallon containers of concentrated product. When diluted with 4 parts water to 1 part BunkerBinder, each gallon of concentrate covers 125 square feet of mulch. 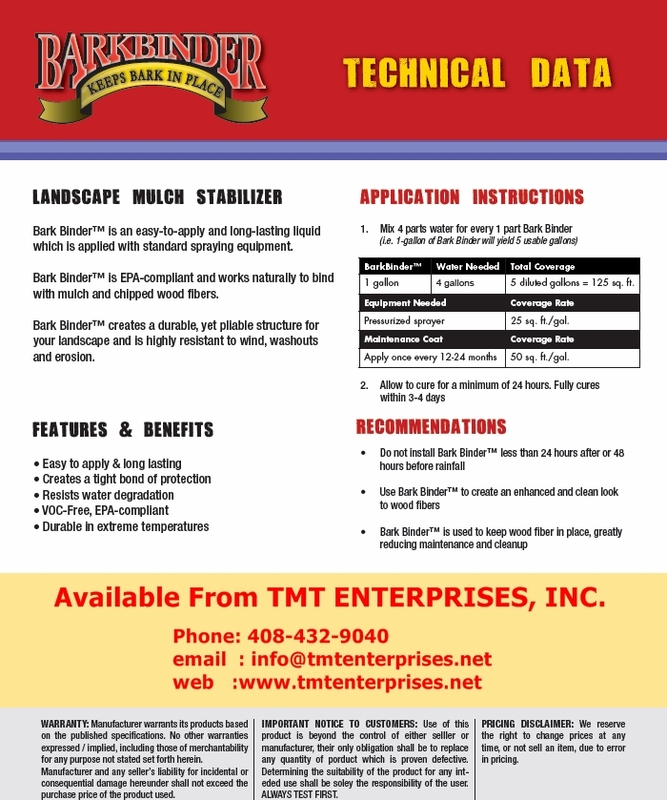 TMT Enterprises is offering BunkerBinder at a special introductory rate through the month of April. One-Gallon bottles, normally $33.00 each, will be just $30.00 and the five-gallon jugs, normally $125.00 each will be on sale for $110.00 each. This means your cost per square foot could be as low as 18 cents! Mulch is an important element of any landscaped area. Unfortunately, it is also a constant maintenance issue in many cases. If you are responsible for maintaining large mulched areas, you know exactly what I’m talking about. bark or wood fiber mulch is constantly displaced, either by wind & weather or traffic through your landscaped areas. This results in the (often daily) use of blowers, brooms & rakes to get the mulch back in place. This is not only a headache, but a steady drain on precious resources. Bark Binder can help ease the pain of this daily chore. Bark Binder is easy to apply using standard spray equipment, is long lasting, VOC free & EPA compliant. We are confident that this product can save you time & energy on a daily basis Give us a call or email today for more info. In part three of his interview with Seth Jones of Golfdom Magazine, Paul tells us about groundwork being laid today between Pasatiempo Golf Club, the cities of Santa Cruz & Scotts Valley to make sure everyone gets the water they need in the future. Paul Chojnacky of Pasatieompo Golf Club Talks About the Futre of Water Conservation in the Golf Business. from TMT Enterprises, Inc. on Vimeo. Tim Powers, CGCS & Crew Recognized for Their Outstanding Environmental Stewardship at Crystal Springs GC. It’s always good to see positive news about someone in the golf industry, but it’s even better when it’s a local golf course and a good friend receiving some well-deserved recognition. We would like to add our congratulations to Tim Powers, his crew & the management of Crystal Springs GC, for receiving the Golf Course Superintendents Association of America/Golf Digest, Environmental Leaders in Golf national award for 2011. The efforts of the management & staff at Crystal Springs not only turns out a gem of a golf course, but provides the public with a better understanding of the environmental positives that golf courses provide every day. Something that non-golfers need to know is happening. Powers & Crystal Springs are featured in the February issue of Golf Course Management, the magazine of the Golf Course Superintendents Association of America. You can see the full article here. If you’re a Bay Area golfer & you haven’t been to Crystal Springs, you need to check it out. Visit their web site here & book a tee time or learn more about this great, local, public golf course. To read the article in the San Mateo County Daily Journal, click here. Congratulations again to Tim & the crew and thanks for your commitment to the environment as well as the great game of golf. Water is a very hot topic these days in all sorts of ways. As big water consumers, golf courses are often the target of negative press & misunderstanding. In this short video, Paul Chojnacky, Golf Course Superintendent at Pasatiempo Golf Club explains to Seth Jones of Golfdom how the recent renovation helped reduce irrigation requirements. Paul Chojnacky of Pasatiempo Golf Club Talks Water Conservation from TMT Enterprises, Inc. on Vimeo. In our next installment, Paul will tell us about Pasatiempo’s plans for even more conservation. Paul Chojnacky, Golf Course Superintendent at Pasatiempo Golf Club talks with Seth Jones of Golfdom about the use of goats to restore difficult areas of the golf course to it’s original design. Pasatiempo Golf Club was designed by famed golf course architect Alister MacKenzie, who’s works also include Cypress Point, Augusta National, The Meadow Club and another Bay Area course that’s been in the spotlight lately, Sharp Park GC in Pacifica. Pasatiempo opened in September of 1929 and still consistently ranks in the top golf courses in the world. 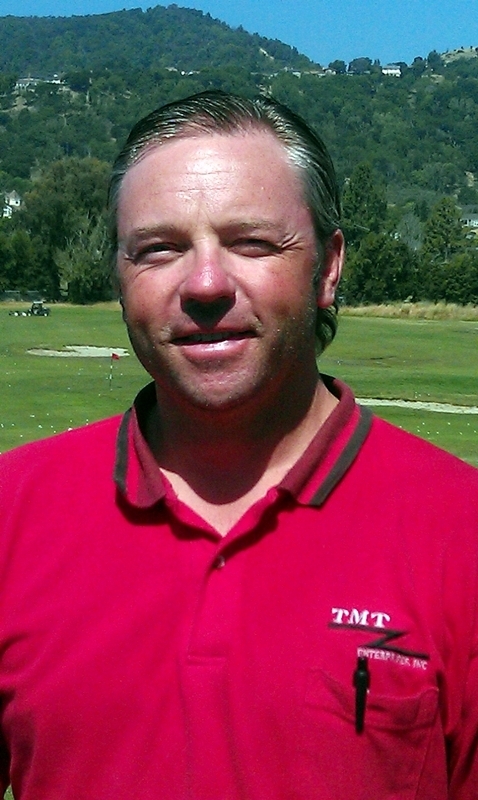 Paul Chojnacky of Pasatiempo Golf Club Talks Course Restoration from TMT Enterprises, Inc. on Vimeo. You can check out Paul’s blog for more on how the goats helped eradicate non-native species & restored the terrain in areas that would’ve been much more difficult for his crew to tackle. Call, email or drop by today to pick up or place your order for delivery. Take advantage of the great weather we’ve been having to get your fields ready for play. Avoid rain-outs this year by adding PlayBall! or Turface to your infield skin to control a wide range of moisture conditions. Then add a small application of RainDelay polymer absorbent to handle those extra heavy rain events. 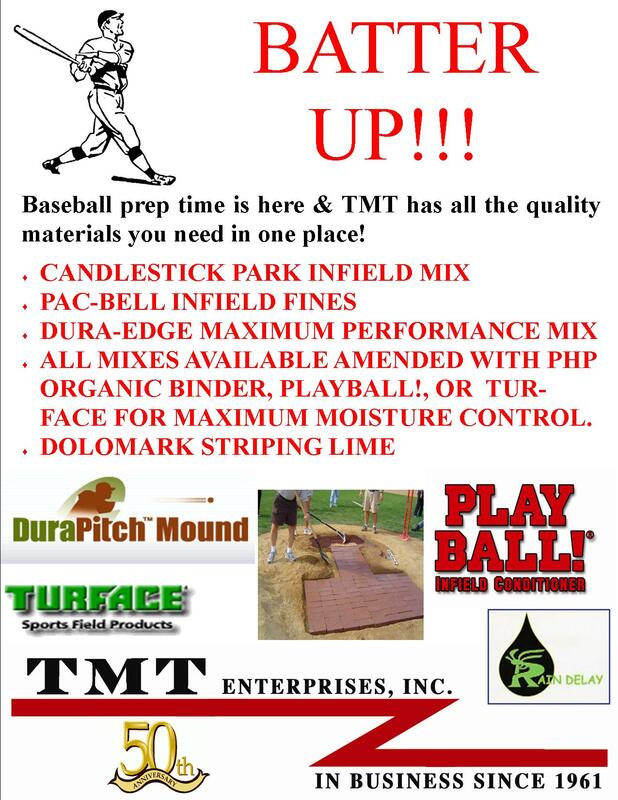 Infield mix, bulk or bagged clay, clay bricks, infield or turf conditioners, drying agents, striping lime and more. TMT has you covered!